" I received my first order the other day and I am so very pleased with the quality of your merchandise. I just love the car seat blanket ... what a wonderful idea. " These high quality car seat blankets are made from 100% cotton flannel, and are available in your choice of 1282 different prints. The 44"x 44" size is designed for both newborn and infant car seats. 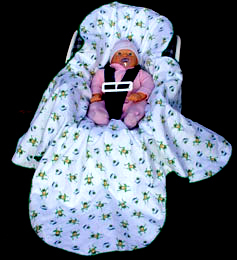 The clover leaf design allows you to keep your baby warm without interference from the car seat straps. Both single and double thickness blankets are available (single thickness for warmer climates). Simply choose your flannel print, thickness, style, and kit options and order today.